Description: Westbound on track three where he will stop at CP SO to cut off his helpers. The train to the right is the 688. 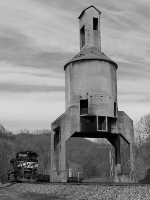 Description: NS train 18M splits the signals near Chattaroy, WV. Description: A pair of Dash 9's power this westbound intermodal train through Cassandra. Description: This westbound caught us by surprise! 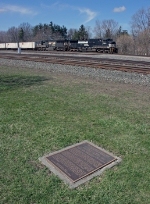 Description: NS 206 rolls by the Dave McKay Memorial Plaque, during the event of "Dave McKay Day", sponsored by the Akron Railroad Club. Description: Rock train 921 westbound.